In an age in which consumers are saturated with around 5,000 advertisements a day, brands are on the look-out for new ways to increase exposure and grow their customer bases. One increasingly popular way to do so is through student brand ambassador programs, in which college students are paid in stipends and free products to promote brands. Student brand ambassador programs, which are offered by countless companies as varied as Delta Airlines, Ford, Lyft, and SoulCycle, require brand ambassadors to advertise their products on campus both in person and virtually. To accomplish this, student brand ambassadors often leverage their personal social media accounts and friendships for the good of the brand. While celebrity brand ambassadors have been used throughout the history of the advertising industry, student brand ambassadors are a more recent innovation. 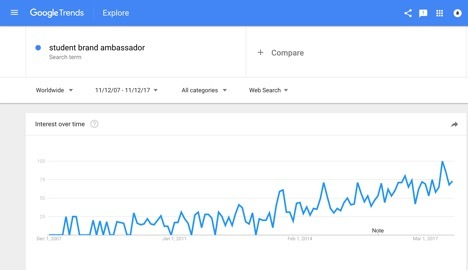 Google Trends reveals that search engine “interest” (searches and results) for the term has risen dramatically over the past 10 years, with a sharp increase beginning in June 2013. Companies have chosen to target college students for their brand ambassador programs for two reasons. First, college students represent a previously untapped market with large spending power. According to the 14th annual College Explorer study by Refuel agency and Crux Research, college students have $545 billion in total annual spending power, including $163 billion for spending on food, cars, and clothing. Second, many college students live on campus—40% at public colleges and 64% at private colleges—where they constantly interact with other college students. Students’ social connections thus provide an efficient way for companies to increase brand exposure and consumer loyalty among this highly coveted demographic. Research has shown that student brand ambassador programs are highly effective for companies. Consumers are four times more likely to make a purchase when referred from a friend, and a company’s average value for a customer referred by a brand ambassador is 16% higher than for an unreferred customer. Refuel Agency’s 2017 College Explorer study showed that 75% of students take action after interacting with a student campus ambassador. Most significantly, companies with brand ambassador programs have higher revenue growth than other companies. Refuel Agency argues that student brand ambassadors can be effective for companies in four ways. First, they start a campus conversation about the brand through ambassador actions like social media posts, contests, giveaways, and tabling. Second, the student perspective allows companies to gain a better understanding of consumer needs and wants. Third, the programs can increase sales, and finally, the brand loyalty of student ambassadors can make them ideal future employees. An interview with Princeton sophomore and L.L. Bean campus ambassador Andrea Reino shows that the company-student ambassador relationship can often be very mutually-beneficial. Reino’s responsibilities include wearing and promoting the brand on campus, posting sponsored content on her social media at least three times a week, visiting clubs once a week and table on campus four times to talk about the brand and pass out giveaway items and coupons. She became an ambassador after her twin sister, who attends Boston College, saw an advertisement for the job on Facebook and applied. After being contacted for an interview, she asked if Andrea could also apply. “The application process was pretty extensive. The preliminary round included an array of questions and a few pictures of myself in the outdoors. Then there were some phone interviews, and ultimately a training trip in Maine where the other ambassadors and I met with important company members and learned more about the program. We toured the facilities and the flagship store and got to see the factory where Bean Boots and totes are made. The other ambassadors were all amazing people and we got to bond a lot!” Reino says. Andrea Reino’s cover photo on Facebook – she is required to make social media posts promoting the brand. “At first I was worried about leveraging my personal relationships/social capital for a brand. I knew a few people in high school who promoted things like coffee brands or pills that claimed to make your hair grow, and their promotional posts were always entirely about the brand. What I really appreciate about L.L.Bean and its ambassador program is that the company encourages ambassadors to post about their normal everyday lives while portraying core company values: a shared love for the outdoors, and staying active. Because of this, I was able to post photos I would normally post, while adding the required #sponsored to make it legal!” she notes. Similarly, fellow Princeton sophomore Matthew Merrigan, who works as a brand ambassador for La Croix sparkling water, enjoys his work and does not feel that he is insincerely capitalizing on his social network. In September, Merrigan was emailed by a company who works to set up firms with student brand ambassadors, and thought the email was a joke at first. “My friends know how much I love La Croix, and I thought that they were just fooling around with me. When I realized it was a genuine opportunity to work with the company, I was absolutely thrilled!” he enthuses, noting that he was a big fan of the brand before he was appointed campus ambassador. “My role is to promote La Croix as a brand all around campus. I try to do that in a number of ways. By posting photos of La Croix on Snapchat, Instagram, etc., I think that it constantly reminds people who have me on social media about La Croix. I know it’s sort of funny to represent sparkling water on campus, but I think part of what makes my role as a brand ambassador so fun is by playing along with some of the jokes,” he says. Merrigan further explains that he adds a personal touch to his posts with his sense of humor. “Having fun with my posts and being able to mock myself a little throughout the process makes the product so much more present on everyone’s minds. I think that my posts on social media are more fun and humorous rather than solely focused on promoting the product. I try to incorporate La Croix into my Instagrams, for instance, without directing the full attention to the fact that I’m drinking La Croix. Having fun with the social media posts, and being able to make fun of myself a little in the process makes it much more enjoyable rather than focusing solely on the fact that I am trying to represent the brand,” Merrigan remarks. With these upsides for the representative and benefits to the company, Student brand ambassador programs seem to be growing heavily, as they undoubtedly represent a more personalized and cost-effective way to target a key market. It will be interesting to see what the future holds for these programs – will a saturation point eventually be reached in which they will no longer be effective? Or will they continue their market take-over? Only time will tell.